Well, four weeks into it and I have had to make some serious changes to our packed out looping schedule. Click here to read my post regarding my original looping schedule, or just continue reading to see the changes that I have made. 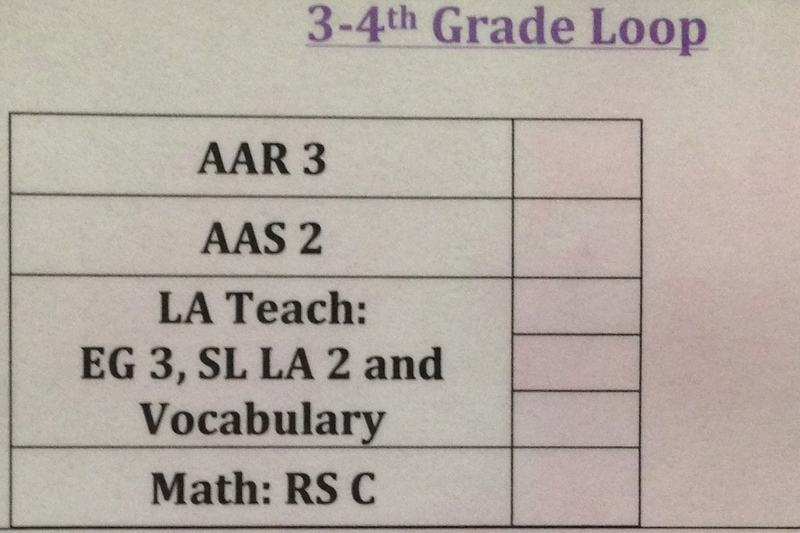 The next thing you may notice is that I anchored Math RS C (Right Start Math Level C) in the 3-4th Grade Loop time slot. I just couldn’t stand not teaching math every day. 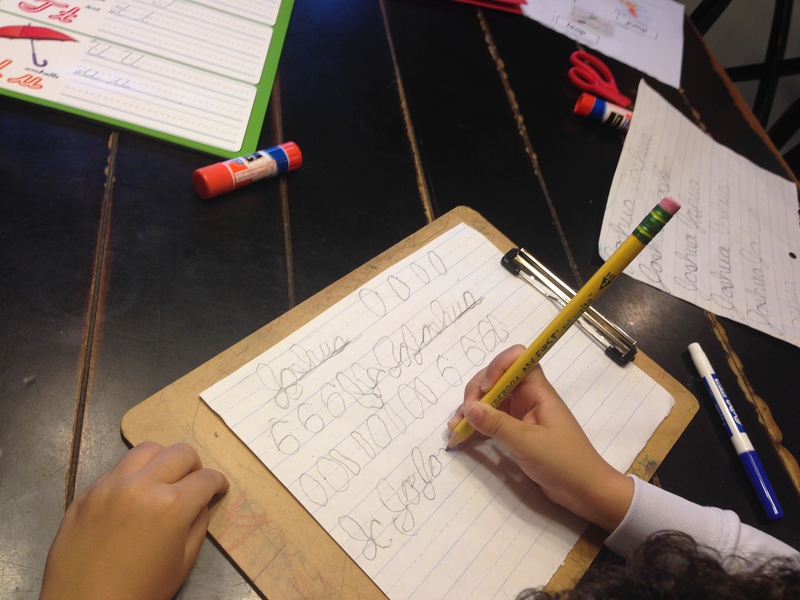 Yes, the kids still practice the math facts during independent practice time, but the Right Start curriculum is just too good, and, according to the kids, too much fun, to not do every day. 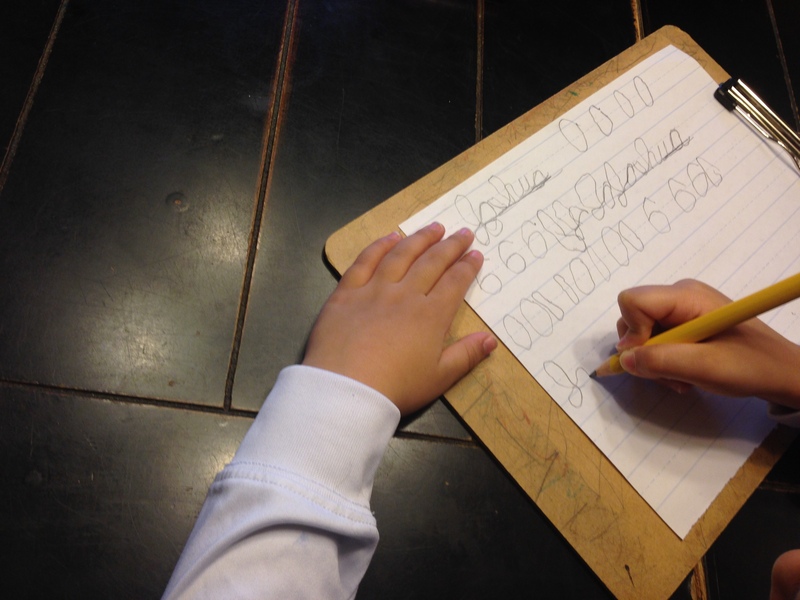 Can’t argue with kids who want to do math, so I anchored it. I didn’t give it a specific time frame, but we generally work on a lesson for about 30 minutes before we move on to the looping activities. Kids creating their own textbooks! What a phenomenal idea! Our notebooks will be a topic of a future post, so suffice it enough to say that the interactive notebook has trumped Easy Grammar and Sonlight for now. Another thing I have added to my schedule is a column to keep track of the lesson that we are working on and a column to mark when that lesson is completed. This addition helps me to keep track of where I am in the loop. I generally continue an activity until the lesson is complete, so if we haven’t finished the lesson within the time frame allotted, I know to continue with it the next time we meet for that looping period. required much more attention than a casual read, as I am sure all of the others will as well. What was I thinking?? The kids love literature time. Even the twins want to know how Professor Sherman managed to get from one balloon over the Pacific Ocean to the 20 in the Atlantic. 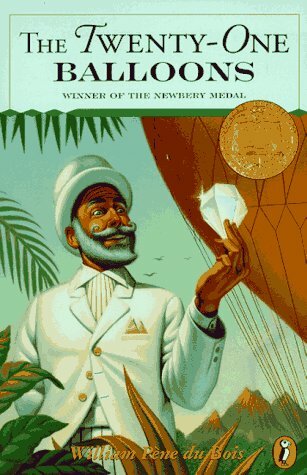 From a balloon house basket to a volcanic island, inquiring minds want to know. Boooo! I really didn’t completely drop it however. I am adding it to our read aloud list, so Hero Tales will get its full time of glory when we finish The Twenty-One Balloons. 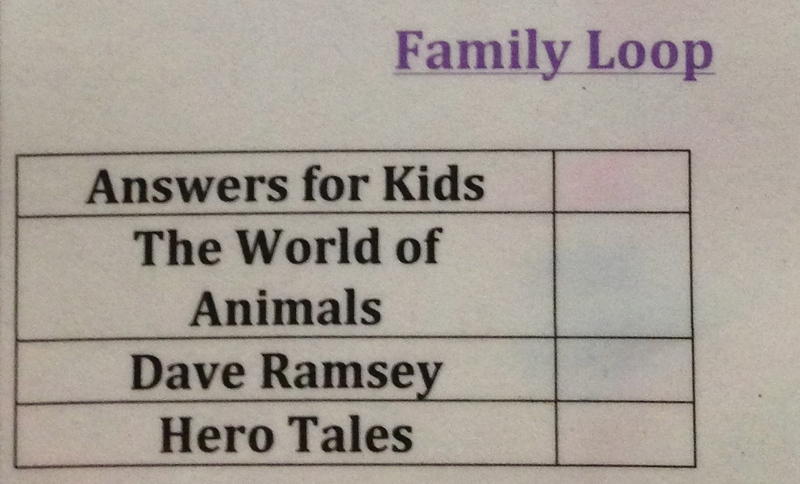 Next, I moved Dave Ramsey’s Financial Peace Jr. to Thursdays. This is a perfect fit for our shopping day and has also become the kids payday. We only have one more lesson in this curriculum, but I am planning to keep this time to practice our money counting and spending habits. So much problem solving happens here and they see the relativity of their math lessons. The kids love the Bible Answers curriculum, as well as science, so allowing longer periods for both makes everyone happier. Finally, I am so incredibly happy with The Homeschool Piano curriculum from Jazz Edge, that this also begged for more scheduled time. Originally I planned to continue with the Family Loop during this time slot, but the kids actually wanted to watch more Willie, the piano instructor, so I couldn’t argue. At about 3pm, I review the kids remaining independent practice work and head out for my jog with my dog and my much needed alone time with my Lord. He is the One who gives me daily strength and patience. This year, we have decided to implement an official looping schedule. 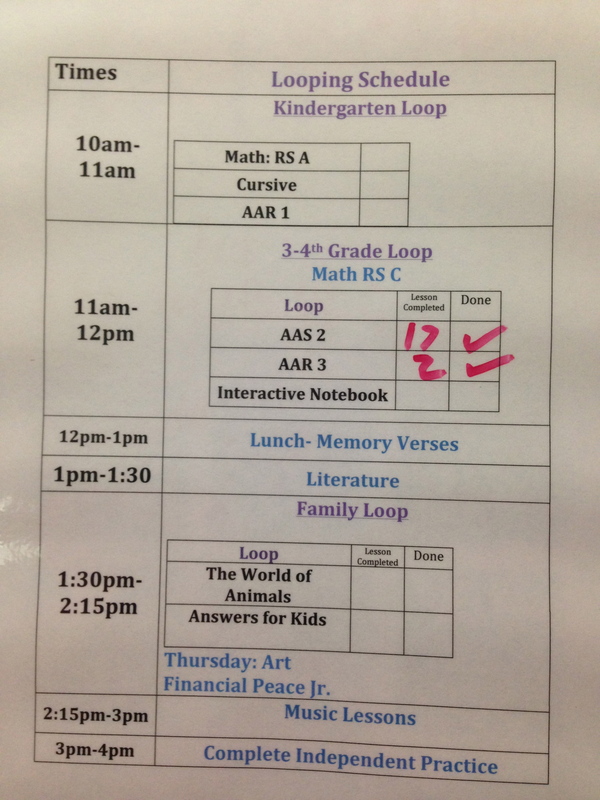 In the past, I have naturally looped subjects with my oldest’s high school schedule. This was before I knew that this form of scheduling actually had a name, so this year I decided to make it official with my 4 younger kiddos. I believe this form of scheduling is ideal for larger families. I have 3 blocks of time during which we loop through subjects. 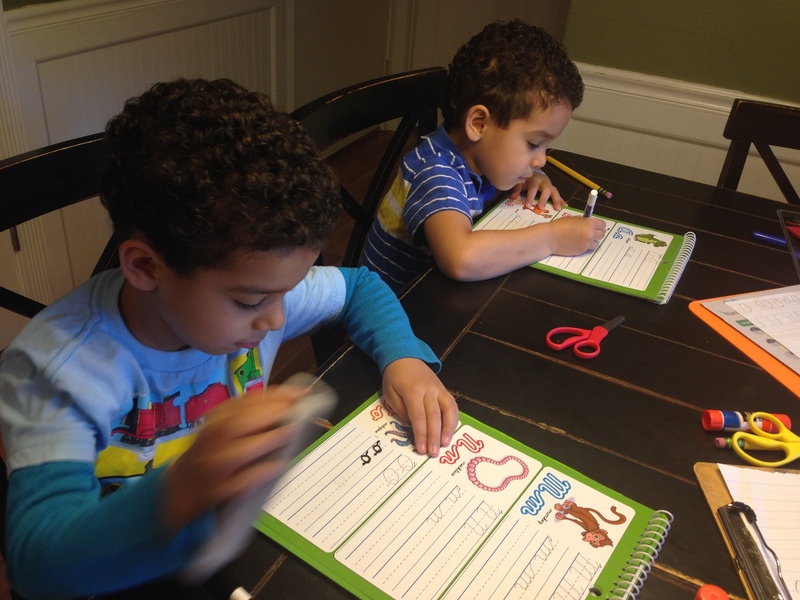 During the first block of time, I work with the twins on math, cursive, and reading. Also during this time, my 2 older kids are working on independent practice items, such as math facts, reading, and typing. Their list of independent practice is rather long and will be a subject for a future post, as I am working on managing this as well. The second block of time is dedicated to my 2 older kids, during which I loop through their core subjects, such as math, reading, and spelling. Much of this time is spent teaching the kids a concept which they can practice independently. For example, I may take about 15 minutes to teach them how to find subjects and predicates so that they can independently work on their Easy Grammar lessons. 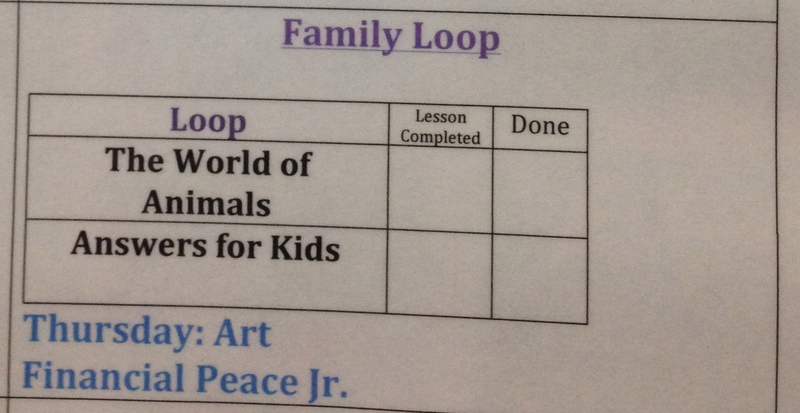 The third time block for looping is when the whole family comes together to work and learn through various subjects. 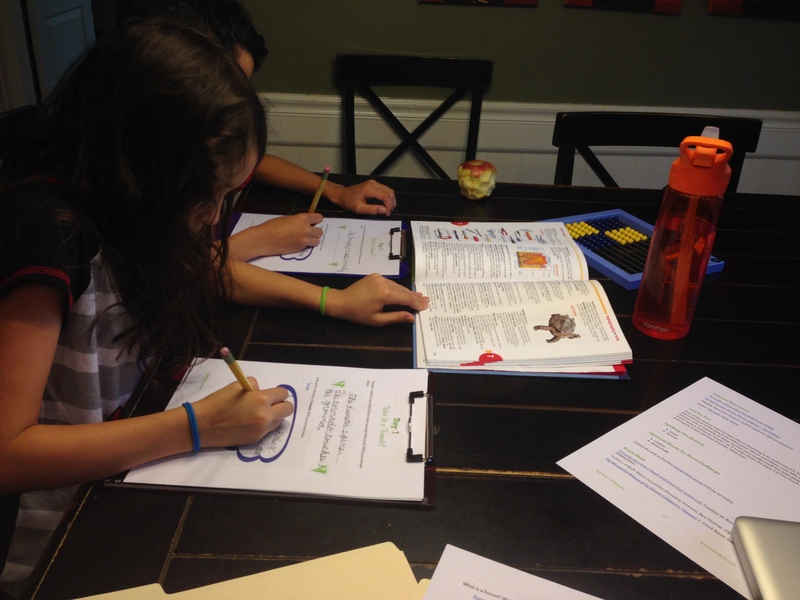 We are working through the Answers for Kids curriculum and God’s Design for Life by the same organization. This is our favorite part of the school day. 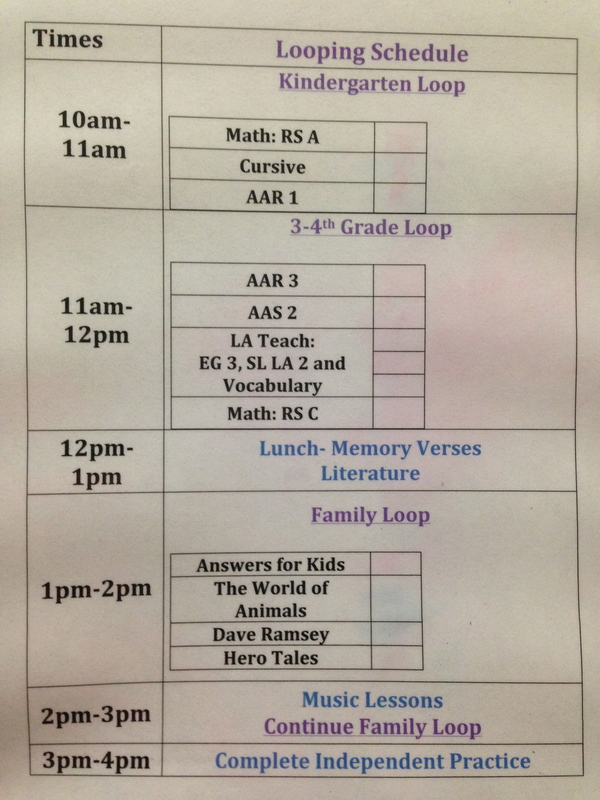 Even though it may seem like we may not get to each subject every day with this schedule, the reality is that they are working through each subject, whether during their independent practice time, or even during the family loop. So far, this type of scheduling is working very well for our family. Below is a copy of the schedule, followed by a subject key. Unfortunately, I am unable to format the charts above, and get them to actually look like they do in my Word Doc, so in order to save my sanity, I am going to leave it as is. I am hoping that we read many more books than this, but I don’t want to set us up for failure, so we are starting small. I pray everyone has a successful and rich school year. This weekend, my husband and I left the kids with Grandma and went on a retreat to the Christian Heritage Conference with key note speaker Ken Ham. It was not technically a retreat. It was actually a homeschool and family discipleship conference; but, since we stayed in a hotel room without the kids, I’ll call it a retreat. Our family supports Answers in Genesis and the outreach this ministry provides through conferences, curriculum, and the Creation Museum, so we were tremendously exciting to have a chance to listen to Mr. Ham speak in person. I took away several encouragements during this conference, but want to share 3 of the big ones here with you. 1) It is of the utmost importance that we teach our kids how to defend their faith Biblically in this Greekified culture. Mr. Ham explained the difference between an Acts 2 evangelism, which is spreading the gospel to a society that already has the foundation of God as creator and understands sin with death as it’s consequence, and Acts 17 evangelism when one is evangelizing to a culture in which there are many gods and death is believed to be a natural process of life. America has become an Acts 17 culture. Most have become Greekified, and therefore we, the evangelizing Christians, must be sure to define our terms. By started with Genesis, we can define God as The Creator and sin as the cause of death. We must teach our children that the Bible is the authority and that science proves God’s word is true. 2) The second point I got out of this conference was from a workshop hosted by Jennifer Bliesner about the effects of technology on brain development. Research has shown that technology changes the size and texture of the brain by keeping kids at lower level thinking patterns. Computers only teach through patterns and do not require interaction with language; therefore, higher levels of conceptual thought do not develop when a child is learning at a computer. Bliesner encouraged us to promote empathy in our children by labeling emotions with meaningful words and fostering meaningful discussions within our schoolwork, rather than sitting them at a computer where language rich interactions with a subject do not occur. Computers and TV are a primary reason for language and information processing disorders in today’s culture. 3) This workshop also confirmed and encouraged my conviction to homeschool for the glory of God. Dr. R.C. Sproul Jr. explained the fact that our children are made in God’s image; therefore, since we are to render to Ceaser what is Ceaser’s, that is a coin with his image on it, we are also to render to God what is God’s, that is our children made in His image. My goal is to educate my children so that they will understand God’s world: how He created it, and how He saved it. God’s Word will equip them for every good work. His Word will be the main text in our homeschooling and our life learning. The week before Spring Break had a frustrating start, but ended in accomplishments in growth. On Monday, I spent about 15 minutes teaching one of the twins how to make circles, again! He seemed to have lost all orientation with the top, middle and bottom lines, but only while making a circle. He consistently writes his capital J in the lines, so I know he understands the concept. We also had to spend a considerable amount of time finding 2’oclock when orientated at the top line, although he understands how to find 2’oclock when he writes his o and a from the midline. This twin’s brain was turned off! To top that off, my daughter rushed to play through her piano piece and played the entire thing incorrectly. I think she was hoping that I wasn’t listening. Well I was, so I very patiently, with a smile, went to sit beside her in order to help her play it correctly. The minute I sat beside her, she began to cry! If you have been reading my posts, you know the battles that we have had with the dreaded piano lessons. The piece is only 2 lines long! But the Monday woes were not over. Both my 7 and 10 year old decided to use their checklists as a race agenda. 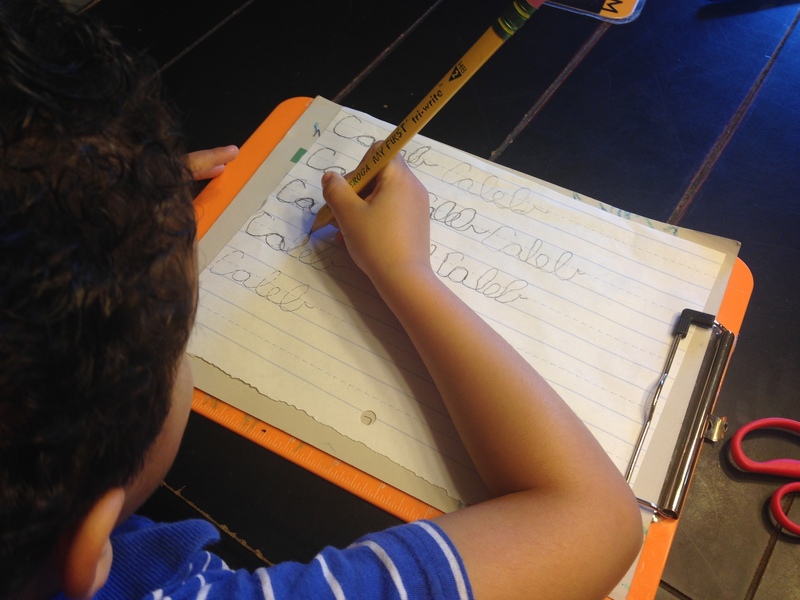 Each child spent about 5 minutes on each checklist item. 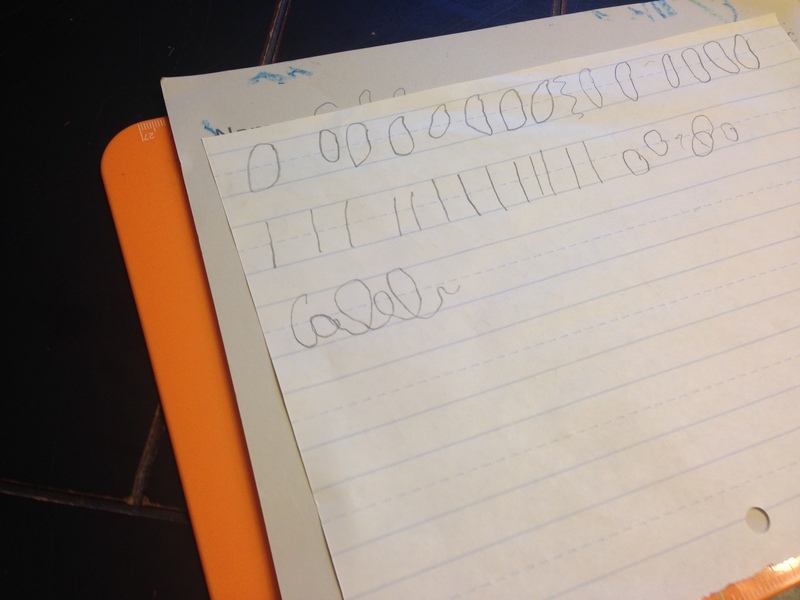 At one point, my drummer boy took out a book, looked at it, and then marked his reading log off as done. Really! Both practiced their typing for about 2 minutes and my drummer boy played his guitar for 5. 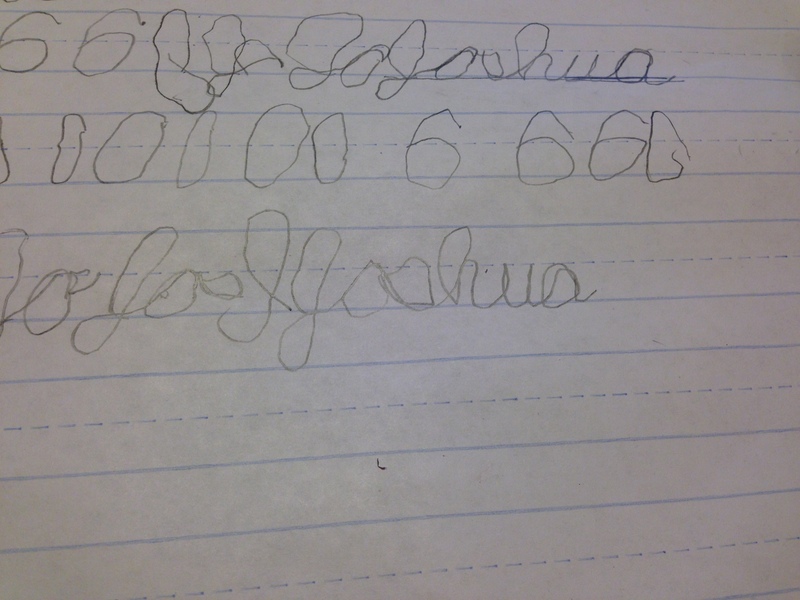 On Tuesday, the twins decided to switch roles in their cursive practice. The one who struggled Monday, did much better with sticking between the lines, but the other had a melt down, because he couldn’t do things his way. When he needed my assistance, he didn’t want it. Then when he messed up, he got upset. I insisted on aiding him, but he resisted. I do, however, always win! I added times to the checklists and the kids had fun setting their timers. Their work was of a much better quality and there was no melt down at the piano! On Wednesday, the twins did the ol’ switch-a-roo again! Both did much better at writing in the lines, but this time it was the others turn to attempt to control the situation through whining. The outcome was the same, however. Mom won! Thursday and Friday were pretty low key. I did end up correcting the twins grip. One of them actually writes better with the incorrect grip, so I am reluctant to correct much further. I will, however, gently guide him towards it as he continues to practice. The other twin corrected his grip quickly and easily. And these twins are identical? 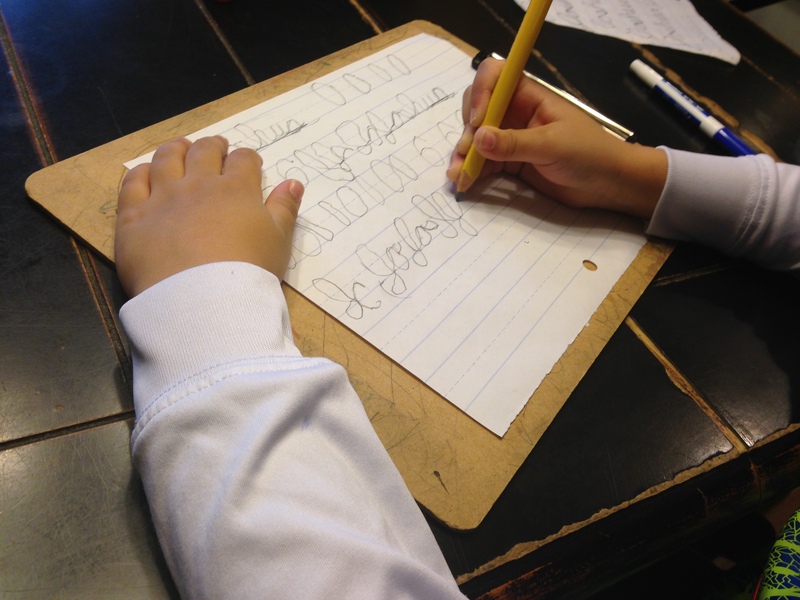 We started Easy Grammar, Grade 3, a few weeks ago, and we are truly loving it. My daughter and my drummer boy have both memorized the list of prepositions and find the lessons to be quick and painless. I was worried that my drummer boy would struggle through grammar, because of his language processing issues, but he is progressing very well and I am seeing connections forming. We did have one issue with the order of adjectives to nouns, that told me a lot about how my drummer boy processes and retrieves information. In the lesson, he had to unscramble the prepositional phrase. The scrambled words read, “old inside an shed.” He unscrambled them to read, “inside an shed old.” I had him read his phrase out loud and then asked him if it sounded correct. He said that it did. Then I read his sentence back to him the way he had written it, and asked him again if it sounded correct. He held to the affirmative. Next I asked him if “the boy young” sounded correct. He thought it did, but when I asked him which sounded better, “the boy young” or “the young boy,” the light went on, and he said that the young boy sounded much better. So then I asked him again if the shed old still sounded correct. He did not connect the two phrases, so I asked him to choose which phrase sounded better, “an shed old” or “an old shed.” At that ah ha moment, he took off, and with only a little more help, completed the lesson correctly and quickly. My oldest and my drummer boy have been participating in educational therapy through the Essential Learning Institute for about a year now. I haven’t seen much improvement in my drummer boy’s ability to recall word meanings after an exercise, so I called the therapist for advice. The therapist decided to move him back several lessons until his word meaning recall becomes more automatic. I had to encourage my drummer boy to persevere through his exercises this week. I explained to him that this will make the brain stronger so that he can learn easier, just like physical exercise makes the body stronger, so that every day life is easier. I believe I was encouraging myself as well, because I am just as sick with this therapy program as he is. The program was only supposed to be 9 months and he would be “fixed.” Honestly, that should have been a red flag right there, but I was suckered in anyway. It is not all for waste though, we have seen tremendous improvement in his language processing capabilities, but is that because of the therapy, or the GAPS diet, or the art classes? How is one to tell? My oldest says that it has helped his concentration, so that is good. Still wondering when it will end though! We have been studying 1 Samuel and this week we studied the story of Abigail and her foolish husband Nabal. I was amazed that Abigail actually took the blame for her foolish husband’s actions toward David which nearly got them all killed. This was the characteristic trait that I wanted to teach my children. I have been pointing out situations in which they place the blame on another, and ask them to rethink it “Abigail style.” For example, when a younger sibling is playing with legos and leaves the room without cleaning up, and an older sibling is in the room, not playing with the legos, but sees that the younger sibling has left the room without cleaning up, that older sibling should remind the younger sibling of our clean up rule and then help him clean up. Therefore, when I tell everyone to clean up the room, and I hear, “But I did not make the mess!” I can redirect their thinking Abagail style. It is a humbling experience to take the blame for someone else, but Jesus took the blame for us too. This week we also started our first Amanda Bennett, Twisting Tornado, unit study. It should only take 4 days, but will probably take us 8. My drummer boy is easily distracted this week, probably due to the Zyrtec, but it is either that or allergies, not sure which is worse, so the study is taking longer than it might when he is better focused. This is our first unit study and we have only completed the first day, but I already love it. I especially love how she incorporates scripture. This gets us out of the box of grammar, spelling, and math as separate subjects and connects it all together. 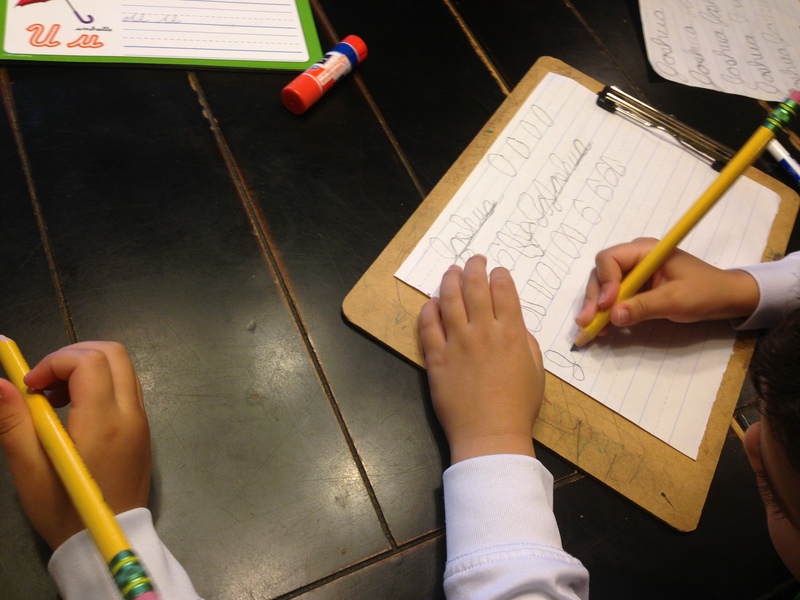 It allows the kids to express themselves and critically think about a subject. This study even had the kids use a dictionary. Oops! I may have forgotten to teach that skill. I look every unknown word up on Google. I guess they should learn how to do both, just in case they don’t have a computer, Iphone, or Ipad near by, which is almost never for my kids. I actually had to dust the dictionaries off! We chose to study tornadoes because the book club we had joined chose weather as the first month’s theme. Not to mention that ever since we had read “The Wizard of Oz,” the kids have been obsessed with tornadoes. More updates to come on this engaging activity. That’s the skinny on the week before spring break as we anxiously await the arrival of our beloved family. If you ever want real accountability for being in the Word of God on a daily basis, then sign up to teach the kid’s ministry at church. I teach kids from ages 9-12 every Thursday evening. We are going through the books of Samuel. I don’t use any curriculum; I simply inductively study the chapter during the week and teach the lesson the Lord gives me. This keeps me daily in the Word, studying and reviewing the chapter that I am teaching. At home, the first thing we do each morning is our family devotions. During this time, we read through the Bible together. It took five years to read the entire Bible together the first time, and we are just finishing up Deuteronomy in our second read through. I also read a Bible story to the kids every night before bed from The Egermeier’s Bible Story Book, but I have been longing to do more. I long to teach every subject through the Bible and my Thursday night Bible studies with the kids at church have prompted me to add more Bible study to our day at home. My “intellectually disabled” drummer boy, get’s very little out of Thursday night’s Bible studies. His canned answer to every question is “God.” He really wants to understand it though, so I have decided to give him a head start in the lesson. This has lead me to teaching language arts, at home, through the Bible. Monday through Thursday, we inductively study the chapter I will be teaching Thursday evening. Now my drummer boy gets at least half of the answers correct on Thursday evening and he is much more engaged. 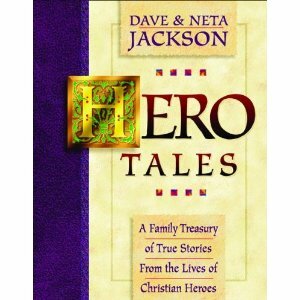 Every narrative element can be studied through the Bible. Studying the Bible builds character and gives value to doing school. If glorifying God is the purpose of school, of course His Word should be the main subject. All three categories of the trivium can be practice through inductively studying the Bible. Through observation, language and speech can be practiced. This week my drummer boy and ballerina practiced summarizing and orally retelling the battle between David and Goliath. Thought is practiced through both interpretation and application of the scripture. Last week, my students interpreted the symbol of the Amelikites as the flesh. They researched God’s Word regarding the flesh. They found out what it is and what to do about it. Then they orally explained what they are going to do about their own flesh, for more practice in the speech skill set. It is my intent to do more of this as my drummer boy’s therapy programs are completed, but for now I have had to move our read alouds to the evening time after dinner. I am also in the process of freeing our family from curriculum enslavement so we can add more project time and science to our day. I will be posting more about how we are accomplishing this in future posts. Happy studying! I just posted a blog on my Biblical site “Word as Light.” It is a testimony on Matthew 6:24, you cannot serve God and money. I pray that it may wake up some parents who have also fallen into the idolatry of serving money. It is easy to do, but God is patient and merciful.